Ella Bradley on her way to a podium finish in the 300m Hurdles. 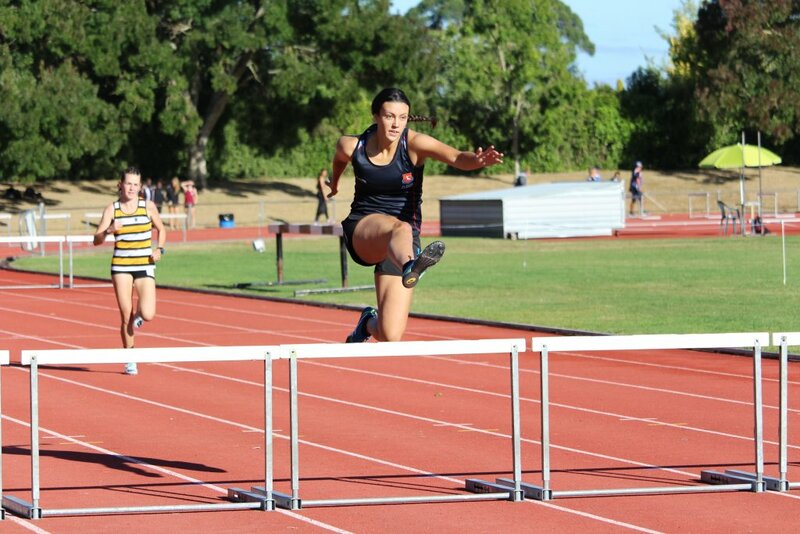 A team of St Peter’s students competed in the Zonal Athletics Championships at Porritt Stadium earlier this month, securing the school’s record-number of athletes to qualify for the Waikato Bay of Plenty Championships. 39 young athletes qualified for the regional competition after competing against a hoard of Hamilton-area schools at the event at Porritt Stadium. 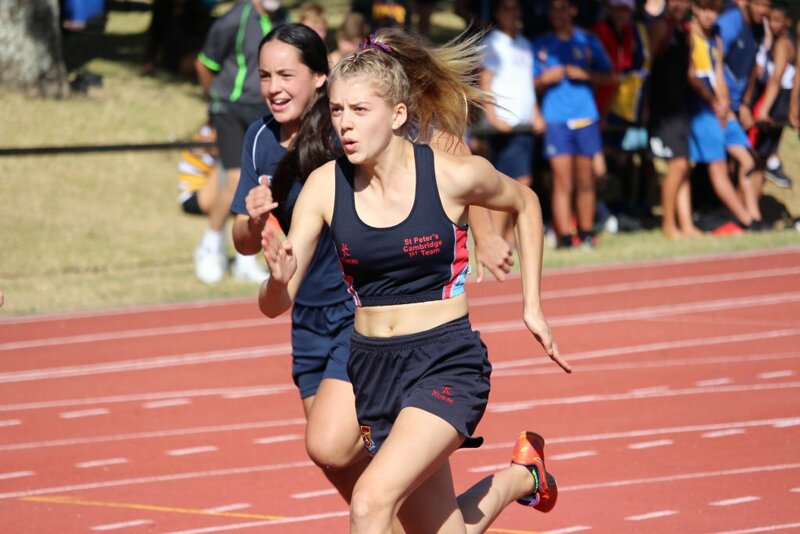 Georgie-Rose Boyd, double qualifier in the 100m and 200m finals. Highlights from the day included Jemima Antoniazzi breaking the record by two seconds in the intermediate girls 3000m race in a time of 10:19. St Peter’s student Courtney Elliot took second place in the race which included all age groups. 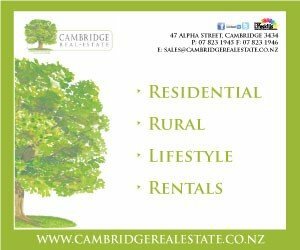 Another St Peter’s student Milana Tapper finished third overall and first for junior girls. The students earned 43 podium finishes overall with four gaining double titles – Jemima Antoniazzi, first in the 3000m and 1500m intermediate girls finals, Annalies Kalma, first in the 200m and 400m intermediate girls finals, Will Taylor, first in the 800m and 1500m intermediate boys finals, and Hayden Waddell, first in the 800m and 1500m junior boys finals. Karl Bradley gets the baton to Matthew Raath in the senior boys relay. 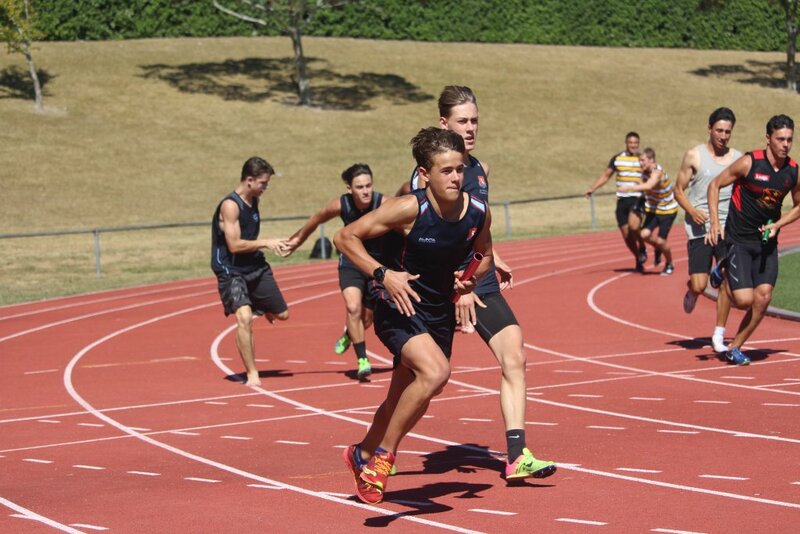 The 39 qualifying students will return to Porritt Stadium this Saturday, March 23 to compete in the Waikato Bay of Plenty Track and Field Championships.